The Oregon Electric Railway Historical Society was founded in 1957. The OERHS is an Oregon Non-Profit Public Benefit Corporation. It is recognized by the IRS as a Non-For-Profit public benefit Corporation under Section 501(c)3. The OERHS had its first operating Trolley Museum at Glenwood, Oregon along Hwy 6 between Tillamook and Portland. The Museum was in operation from the 1960’s up to October of 1995 when it was closed. Due to declining patronage and a lease set to expire, the OERHS had been looking for a new location with better visibility as well as better weather conditions. In 1995 the OERHS signed a lease agreement with Powerland Heritage Park in Brooks Oregon. This is location of the current Oregon Electric Railway Museum. Electrified trolley operation at the new museum started in 1999. In 2004 the museum started Sunday operations over the summer, plus special events. 2009 started full weekend operation. Each year the museum rail line is extended or enhanced. Also in 1995 the OERHS signed an agreement with the City of Lake Oswego to operate the Willamette Shore Trolley. This tourist trolley line operates between Lake Oswego and Portland Oregon. It operates from May – October each year. The Willamette Shore has changed a few time based on development in the South Waterfront Area of Portland. Current operation is truncated due to work on the Sellwood Bridge with service only between Lake Oswego and Powers Marine Park. The OERHS is a volunteer organization, thus it is membership driven. Members are the backbone of the organization. 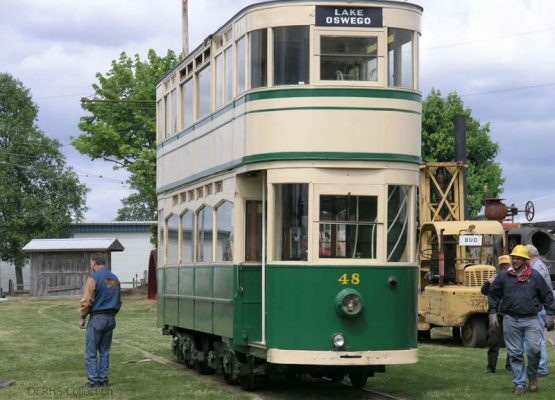 The Mission of the Oregon Electric Railway Historical Society, Inc. is to preserve the regional Heritage of electric railway transportation as a living resource for the benefit of the present and future generations. the display, interpretation and operation of surviving historic equipment, materials and properties.